The switch statement allows to make a decision from the number of choices. If a match is found to a case label, the program executes the associated statement. If no match is found with any of the case statements, only the statements following the default are executed. If no default statement is found, the program continues execution at the statement following the end of the switch. Note that switch statement is almost similar to a series of if statements on the same expression. expression: Value matched against the label. label: An Identifier to be matched against expression. 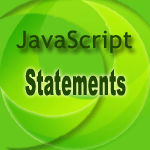 statements: Group of statements that are executed once if the expression matches the label. In the following example, switch statement is used to display the marks range against a particular grade. See the Pen switch-1 by w3resource (@w3resource) on CodePen.